Please find below the various ways in which you can book tickets for an event at the Brighton Centre; whether you're into music gigs, comedy acts, classical concerts, live theatre shows, exhibitions or good old-fashioned family entertainment, we have it all. If you cannot find the venue information you’re looking for here please check out our FAQs section; alternatively you can contact us here or call the venue on 01273 290131. Ticketmaster also has some useful information about Ticketing on their website. Please note that due to Promoter requests, you may not receive your show tickets until up to 5 days before the date of the event. If you have not received your tickets at this point or for any assistance regarding your tickets please contact us on 01273 290131 – please be aware that this telephone number is for information and support only and you cannot purchase tickets via this line. To purchase tickets for the show of your choice over the counter please come down to the Brighton Centre Box Office at the front of the building on Kings Road. Open Monday to Saturday 10am – 4pm. On show nights, the Box Office is open until the main act is on stage, which is approximately 8pm. We accept cash and all major debit and credit cards including American Express. We do not accept cheques or postal orders. To purchase tickets by Telephone, please call us on our automated system 0844 847 1515 (24hr facility run by Ticketmaster. Calls cost 7p per minute plus your phone company's access charge). Please note, booking fees will apply. You are unable to book tickets over the phone direct with the Brighton Centre. The enquiry number listed (01273 290131) is an information line only. Please be aware some shows at the Brighton Centre, particularly exhibitions and fairs, are not available to purchase via Ticketmaster so please always check our the information on the event's dedicated page before calling. To purchase tickets for shows at the Brighton Centre, please use the link on the relevant event page. There is a search option to help you find an event by name and/or date. You can also search by show type including music, comedy, dance, theatre, family, exhibition and other (including sporting events, fairs and ice shows). When you've found the show you are looking for click the “BUY TICKETS” button next to your chosen performance. This facility is run by Ticketmaster and booking fees will apply. Please be aware some events at the Brighton Centre, particularly exhibitions and fairs, are not always available to purchase via Ticketmaster so please always check our the information on the event's dedicated page. By phone: call our access line on 01273 292695. This is a dedicated number for customers who have access requirements. The number connects directly with our Box Office staff who have an excellent knowledge of the venue and the layout of the seating. If there is no answer please leave a voicemail that includes your telephone number and the team will call you back. No booking fees apply. By email: send your enquiries to brightoncentre@brighton-hove.gov.uk. Please include the word ‘Access’ in the subject line of your email so we can prioritise your email and respond as soon as possible. If your enquiry is urgent please mark it such. No booking fees apply. In person: at the Brighton Centre Box Office, located at the front of the venue on the seafront. No booking fees apply. By post: you’re welcome to write to us but please be aware the process will be slower and we’d advise not doing so for a ‘popular’ show in case it sells out before we get your letter. Mark correspondence FAO Box Office Access Champion, Brighton Centre, Kings Road, Brighton, BN1 2GR. Please do not send cash through the post, we’ll advise the best method for payment in our response. For accessible seating requirements please contact our Box Office direct so we can ensure that you receive full guidance on our venue facilities and are able to book the best seats for your requirements. We have an Access Statement which you may find useful; it's available to download as a PDF here or you can download it as a Word Document here. The Access Statement is also available in Easy Read and can be download as a PDF here or you can download it as a Word Document here. The Access Statement includes information on getting to the venue and parking, our early entrance policy, an arrival guide, making your way around the venue, the accessible facilities available in the venue and helpful contact details. Further information on accessibility of the venue is available here or visit our Accessible FAQs section. We have introduced an Access Address Book at the Brighton Centre as part of our continued efforts to develop the venues accessibility. This new system has been designed to help our team better understand our customer’s needs and accommodate their requirements to ensure that the booking process is easier for you and more comprehensive for us. Until we launched the Access Address Book we allocated accessible seating and particularly free Personal Assistants tickets, via an honesty system, we did not ask for proof of eligibility, and subsequently the system was open to abuse. In order to prevent such abuse and ensure these tickets are available only to customers with a legitimate need we decide to change the way we manage these bookings. The implementation of this system means that we are now able to provide a greater number of tickets for our customers and identify areas of strength, and where we might need to improve. For those who require the aid of a free Personal Assistant it means greater ticket availability and for those who visit us independently it will ensure that we find the best location possible to ensure they enjoy the event. If you do require assistance when visiting the Brighton Centre we do offer free Personal Assistant tickets in such cases. A significant advantage of this system is that, by registering eligibility for a free ticket, we are able to issue more tickets rather than old system where the amount was capped per event however, it does mean evidence is now required to be eligible for a free Personal Assistant ticket. Personal Assistants are expected to help with way-finding, assisting the customer into and out of the venue and auditorium, buying and carrying food and drink, and undertaking all access requirements of the person they are attending with. They are not expected to leave the customer alone for long periods of time, be unable to meet the customer’s access requirements, or be inebriated at the event. If your access needs have changed since booking your tickets please contact us and we’ll do everything we can to help you but it will be subject to ticket availability. We have up to 16 spaces available for wheelchair users for most events however, we are looking to review and hope to increase this provision over the summer. There are up to 8 spaces on the South Balcony’s accessible platform which is raised. This area is usually available on both seated and standing shows. The view from the platform is front facing and the area is stewarded. The area is accessible via both lift and stairs. The closest accessible toilet is 25 metres. There are up to 8 spaces available in the front row of the West Stalls. This area is usually available for seated shows. The view from this area is side facing and is not raised. The area is stewarded. It is accessible via both lift and stairs. The closest accessible toilet is 25 metres. There are 8 spaces for wheelchair users available on the raised accessible platform for standing shows located in the North West corner of the standing area on the main floor of the auditorium. The platform is raised, front facing and is stewarded. It is accessed via both lift and stairs. The closest accessible toilet is 30 metres. Tickets for the above accessible areas can only be booked via the Brighton Centre Box Office. For customers who don’t require seats on the accessible platforms but do have limited mobility we advise booking seats at the back of the South Balcony for standing shows wherever possible. 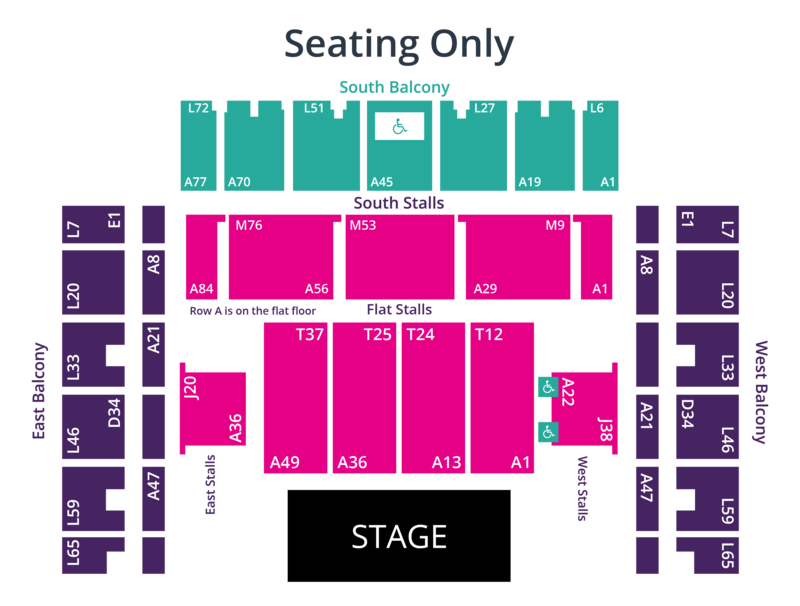 Alternatively on seated performances, the South or Flat Stalls have direct lift access, although please note, all apart from the Flat Stalls do have some steps to access the tiered seating. If you have limited mobility we recommend that you do not book seats in the East and West Balconies or the lower rows of the South Balcony as these areas are more difficult to access. The Brighton Centre is a flexible venue and we’re here to help; we feel any part of our auditorium can be an accessible area if it works for you and your needs. We understand that everyone’s access-related requirements are different be it needing seats closer to the front, a quieter area, raised seating or front facing, so if you are unsure of what to book or for further advice and information please contact us; we’ll be happy to advise you on the different options available at the venue and book you into the best seats for you. Be it a social gathering, a big family outing or a corporate booking, the Brighton Centre does offer a group booking service on many of our shows; just look out for the "GROUP BOOKINGS" button on the event page where you will be directed to a group booking form or directed to Ticketmaster. If we are not looking after this facility ourselves we can point you in the direction of the relevant ticket agency. Either way it’s always best to give us a call on our group booking number 01273 292695, to discuss your options before proceeding. Please note a booking fee may apply to reserve tickets. A "Group" is generally classed as a booking of 10+. 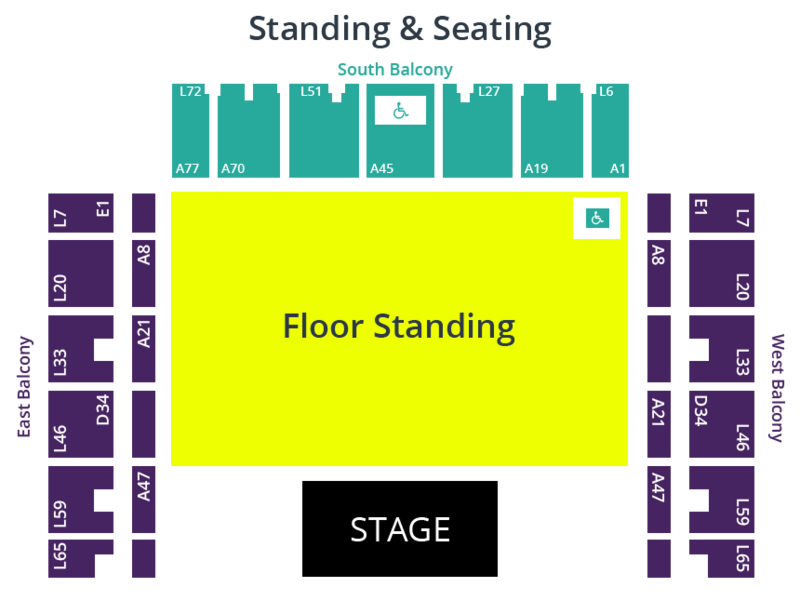 The seating plans below cannot be guaranteed for every event; they are based on our standard layout for live shows. Theatre, sport and family entertainment often have specific and changing requirements, and the below plans are provided as a guide only. If a show has a very specific seating plan that varies from the below guides it may be available on the event's dedicated page as a downloadable media item. TICKETFAST: You will receive an email confirmation with the tickets as an attachment. You will be required to print off and bring your Ticketfast ticket with you as these will need to be scanned on entrance to the show. HARDCOPIES: These can be received via the post or picked up from the venue Box Office. To pick up tickets you will need to bring the card you used to purchase the tickets and/or I.D. All tickets for shows at the Brighton Centre are scanned when you enter the venue via your own personal barcode. Any attempts to duplicate 'print at home' tickets will show up when scanned on entry. You need to make sure that the barcode is clear and able to be scanned. If your ticket has been damaged, please contact us here to discuss voiding the original copies and obtaining a replacement. Please be aware, if you have bought a standing ticket for a live music gig that also has seating, you will be required to swap your ticket for a wrist band. This will be clearly signposted, or please speak to a member of staff if you're unsure. When an event goes on sale at our venue, tickets are sold via our on-site box office over-the-counter, Ticketmaster online and over-the-phone and via the promoter's authorised ticket agents of their choosing. Whilst these agents may vary from one event to the next, they will always be legitimate ticket retailers such as See Tickets, AXS, Eventim, Gigantic, The Ticket Factory etc. Please be aware of unauthorised ticket agencies. If you use an unofficial ticket retailer or outlet, we do not guarantee you access and will not be able to assist you.  If in doubt please visit the Society of Ticket Agents & Retailers website for further information www.star.org.uk or look out for their logo in the footer of the website. If you feel a victim of an unauthorised retailer or outlet we suggest you contact Action Fraud who are the National Fraud & Cyber Crime Reporting Centre, and report the company to the Trading Standards. Only buy tickets from our box office, the promoter, an official agent or if you really want to go and the show is sold out, a well-known and reputable ticket exchange site, preferably one that only sells on at face value, however we strongly discourage our customers from purchasing via secondary retailers. Should you choose to buy tickets from an individual (for example on an auction site, in the pub, or on a social media), never transfer the money directly into their bank account. Instead use a secure payment site such as PayPal. Paying for your tickets by credit card will offer you an increased level of protection over other payments methods, such as debit card, cash, or money transfer services (as these payments may not be recoverable). Always check availability with the venue or Ticketmaster before purchasing from secondary sites as often there are tickets still available to buy at the original price. Check that you’re still on the website you originally searched for. Often customers follow links to external sites via advertising without realising they are no longer buying at source. We will only ever link from the Brighton Centre website to Ticketmaster and will not allow other retailers to advertise on our website. Before entering any payment details on a website, make sure the web address starts with https (the ‘s’ stands for secure). There should be a locked padlock icon in the browser’s address bar. When you receive the tickets check they have a barcode, reference number, clear location (i.e. South Balcony) and exact row and seat number - if these are not listed please contact us and we will do our best to assist you. Booking fees have become an industry standard necessity at commercial venues. Many venues now out-source their ticketing to independent ticketing agents. In our case, we use Ticketmaster. This is the base cost of your ticket, set by the event organisers. Ticketmaster nor the venue are involved in deciding the price, but it's usually based on the costs involved in putting on a tour. If you really don’t want to pay an additional fee on top of the face value of the ticket you can purchase directly from the Brighton Centre Box Office over the counter (in person) Monday to Saturday 10am – 4pm where no fees are charged apart from postage (if required), though we do appreciate and understand that this could be difficult if you are not local. This is the only part of your payment that Ticketmaster keeps – the face value goes straight to the event organisers. The booking fee helps Ticketmaster to cover the costs involved in running their website and telephone booking line. The booking fee can vary depending on the event. This is one charge for the entire order and covers the cost of processing the booking from beginning to end, known as the Order Processing Fee. You then select your delivery method which may be chargeable based on whether you select post, box office collection or eTickets (print at home or mobile). The fees can vary slightly from event to event, but what stays the same is that when you come to the purchase page you will always see all of the fees you have been charged. These are 'Per Item Fees' (booking fees) and an 'Per Order Fees’ (order processing and delivery). By purchasing a ticket to an event at The Brighton Centre you are agreeing to the following Conditions of Sale. These are available on the back of all printed tickets or are listed below. If you have purchased tickets via a Ticketing Agent we advise you familiarise yourself with their purchasing policy. This ticket is issued on behalf of the organisation responsible for the event and is subject to the following terms & conditions. Details of the organisation responsible for the event (event promoter) are available on the front of the ticket, where possible, or otherwise on request from the Brighton Centre, Kings Road, Brighton, East Sussex, BN1 2GR. PLEASE TAKE SPECIAL CARE OF YOUR TICKET AS IT CANNOT BE REPLACED. DO NOT LEAVE IN DIRECT SUNLIGHT. REMOVAL OF THE STUB INVALIDATES THE TICKET. YOU ARE ADVISED TO CHECK YOUR TICKETS ON RECEIPT. STROBE LIGHTING & OTHER SIMILAR EFFECTS MAY BE IN USE. THIS IS A NON-SMOKING VENUE. 1. Tickets cannot be exchanged or refunded after purchase, unless the event is cancelled, or there is a significant change to the headline act. If an event is postponed to another date, all reasonable endeavours will be made to notify customers who purchased tickets from either the venue, or our ticket agents, TICKETMASTER, and advise on the validity of the tickets for the rescheduled date. Tickets will usually remain valid, and refund requests will be accepted (usually up until 2 weeks prior to the revised date, unless otherwise notified). In the event of a date change at short notice (within 1 week of the event), all reasonable endeavours will be made to notify customers of the conditions that apply, and if these are not acceptable, a refund to the face value of the ticket only will be offered. 2. The management reserves the right to refuse admission, or to eject customers in reasonable circumstances (e.g. with consideration to Health & Safety, Environmental & Security concerns), and on occasion to conduct security searches to ensure the safety of customers. Please note that customers may be refused entry, or be ejected from the venue if they are (or appear to be) abusive, threatening, drunken, decline to be searched, carrying offensive weapons or illegal substances, or for any other anti-social behaviour. No refunds will be given to customers who are refused entry or ejected in such circumstances. 3. The management reserves the right to refuse admission if customers are, or appear to be under the age of 14 to the STANDING area of the venue. Also to any child who is, or appears to be, under the age of 14 and not deemed to be under appropriate supervision. No refunds will be given to those, who are refused entry in such circumstances. 4. No cans, bottles, alcohol or food will be allowed into the venue. Only food and drink purchased on the premises may be consumed in the venue. 5. No cameras, video or audio recording equipment are permitted without the permission of the Event Promoter. 6. Latecomers will only be admitted into the venue at a suitable break in the performance. 7. Brighton & Hove City Council does not accept responsibility for any loss, damage, death or injury in its venues, however caused, unless (i) the relevant party has breached its legal obligations; and (ii) such loss or damage is a foreseeable result of the breach. With regards to personal property (loss or damage) subject to the foregoing, the liability of the relevant party shall be limited to the reasonable cost of repair or replacement, subject to wear and tear. 8. Customers details are managed in accordance with the Data Protection Act and information may be used for registered purposes. CCTV and film cameras may be present at the Venue. Attending an event signifies ticket holders’ consent to the filming and sound recording of themselves as members of the audience without payment or copyright. 9. Resale or attempted resale at a price higher than that printed herein is grounds for seizure or cancellation without refund or other compensation, this includes, for the avoidance of doubt, any publication via the internet or any other means with the intend to resell for commercial gain. 10. In seated areas other members of the audience may stand up during the event. Refunds and compensation will not be offered if your view is restricted in this way. 11. We reserve the right to provide alternative seats where it is not possible to allow you to occupy the specific seat printed on your Ticket. In these circumstances we will use reasonable endeavours to provide you with a seat of equal value and we shall have no further liability to you as a result of the change in seats. 12. If you experience a problem please contact a steward so that we can resolve the issue at the event. The relevant UK Law will apply to these Terms & Conditions, & the relevant courts of the UK will have exclusive jurisdiction in relation to the Terms & Conditions. WARNING – prolonged exposure to loud noise may cause damage to your hearing. Flashing lights may be used during a performance. Bottle tops will be removed from all bottles to be taken into The Brighton Centre to reduce the risk of them becoming rolling trip hazards, or used as missiles. Occasionally, drinks will be decanted into plastic cups. Events may be age restricted and it is the responsibility of the Ticket holder to check before purchasing. All children must have a ticket. Unless otherwise stated, children under 14 yrs must be accompanied by an adult (aged 18 yrs or over). When purchasing alcohol, if you appear to be under the age of 25, you may be asked for proof of age. All advertised times are approximate and subject to change. It is your responsibility to make appropriate arrangements to ensure that you arrive at The Brighton Centre in sufficient time in case the Event starts early and to ensure that you are able to stay until the close of the Event should you wish to if it overruns. No refunds will be payable and we will not be responsible for the cost of alternative travel arrangements or for any other loss you suffer (including loss of enjoyment) as a result of an Event not running to the precise advertised times. We are The Brighton Centre ("we", "us" or "our"), of Kings Road, Brighton, BN1 2GR and are owned and operated by Brighton & Hove City Council, of Hove Town Hall, Norton Road, Hove, BN3 3BQ.